To commemorate the '2013 Purification Azalea Festival for the Inheritance of Heavenly Fortune, Chung Pyung Special Great Works' (Purification Azalea Festival) the grace of touring Cheon Jeong Gung Museum was bestowed to the attending members. The Cheon Jeong Gung Museum Pilgrimage was held on the first day (May 3) as well as the second day (May 4) from 3:00 pm to 4:30 pm. 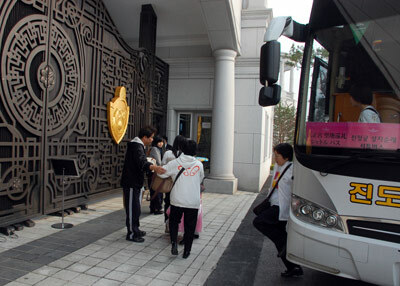 An exclusive bus for the Cheon Jeong Gung Museum pilgrimage was prepared in front of the CheongShim International Medical Center helping the members from around the world to easily access the palace. This pilgrimage had no age limit and the grace of visiting was given to all the members attending the Purification Azalea Festival. Families were happy to visit the Cheon Jeong Gung Museum with their little children. Three languages, Korean, Japanese and English announcement on the way to Cheon Jeong Gung Museum was prepared in the bus. Once the members arrived, the staff of Cheon Jeong Gung Museum guided them using Japanese, Korean and English. First, the families visited Great Hall No. 1. In the hall there was a special exhibition of True Parents Life Photographs as well as a huge screen with commemorative video of True Parents. The photographs were prepared in a chronological order and families enjoyed each photograph. Then they moved to Great Hall No. 2 where a prayer was held. A large screen was prepared showing a live broadcast of the current Garden of Original Homeland. After offering a service and prayer there was a time for the members to write a letter to True Parents of Heaven, Earth and Humankind. Before getting on the bus home the members would walk around the Cheon Jeong Gung Museum and feel the love and blessing of heavenly parents and True Parents of Heaven, Earth and Humankind. Wheel chairs and strollers were prepared by the Cheon Jeong Gung Museum for the members to have a relaxing and comfortable tour. A great event was prepared only for the members of the Moshim association. A small booth was prepared in front of the fountain to take a commemorative photograph. The members would immediately receive the photograph just before departure.